Samphire plant, Crithmum maritimum, is also known as Sampher and Rock Samphire. A seashore loving, aromatic plant. Ideal for coastal gardens. The leaves were used as a pot herb by the ancient Romans and Greeks. Young leaves and shoots a salad herb or sometimes pickled. Its leaves and stem rich in Vitamin C. Traditional folk use of the leave as a remedy for scurry, indigestion and lack of appetite. Samphire plant is native to the shores of the south Baltic and north Mediterranean seas and prefers rocky, well-drained soils in an open sunny position. Frost resistant but drought tender. A perennial plant, growing to 1m x 1m. Volunteers freely – once plants are established will merrily self sow to maintain and increase harvest area. 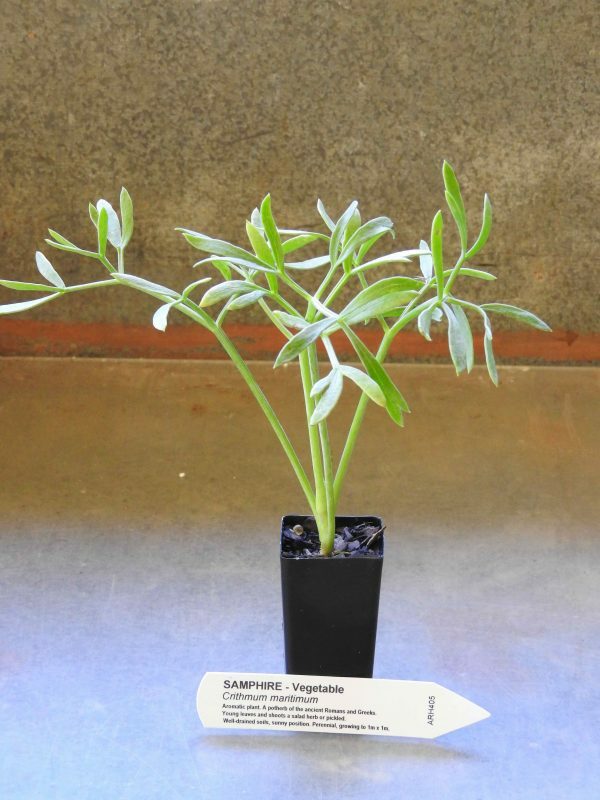 Be the first to review “Samphire, plant” Click here to cancel reply.